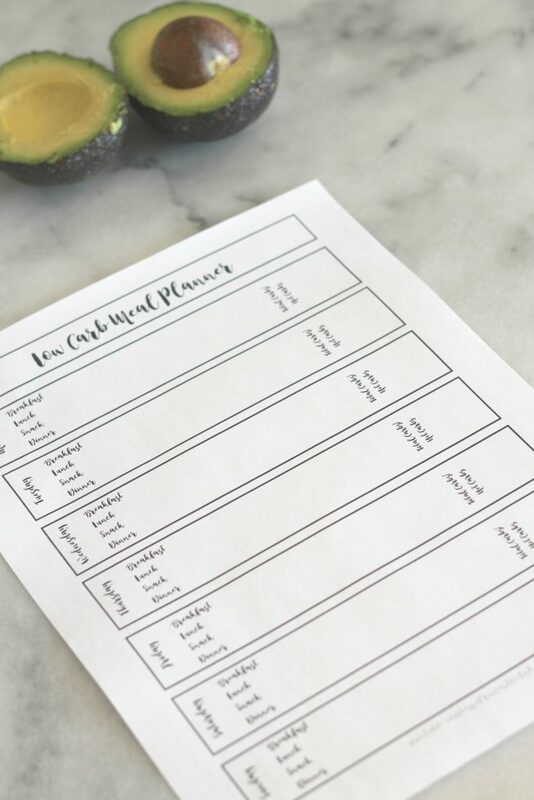 This printable low carb meal planning worksheet is a free tool to help you plan your meals for the week and to stay on track with your low carb or keto lifestyle. I follow a lot of low carb group boards on Facebook (and I’m starting my own, you should join!) and one thing I read daily is people saying that they get off track of their low carb or keto eating at the end of the day. Or I read that they are tired of eating the same old thing. I find that I stay on track of my carbs and macros amazingly up until around 4 pm, when the kiddos get home, and I might steal a bite of their not-so-low-carb-snack. Yikes! Banning everyone else’s snacks from the house isn’t an option, so I found it best if I’m prepared. You know, make a plan and stick to it. 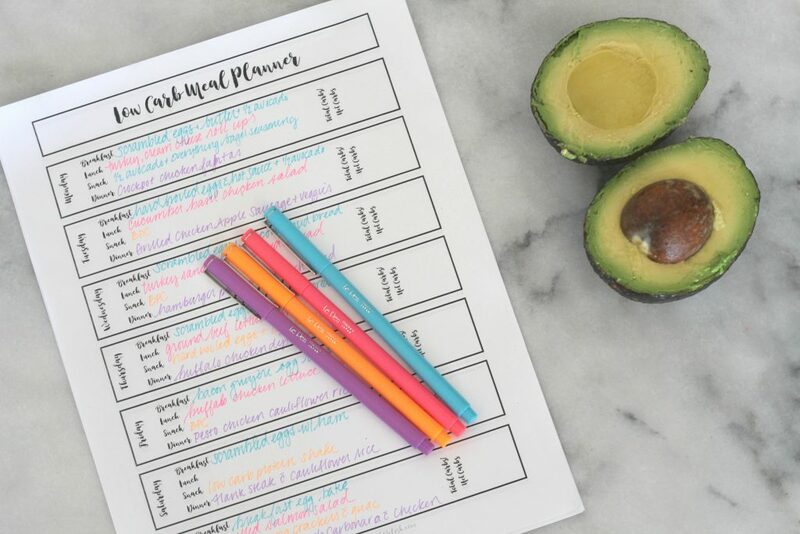 I created a low carb meal planning worksheet that I can fill out and use as my guide for the week. I can fill in what each meal is, and keep a rough idea of how many carbs I’m at for the day. Plus, it helps me on Sunday, when I’m doing my food prep for the week. A quick google search of low carb meal planners showed ones that were already filled out for me. Um, no. I want to pick out my own food! Breakfast is easy because I always have eggs. Always. It’s the dinner and the snacks that get me. But this way I know what to eat and I’m more apt to stick with it since I wrote it down. It’s all in my head. This worksheet is a work in progress. If you have any ideas on how to make it better leave me a comment! Love your Low-carb meal planner; thank you so much for sharing it!! I’m on and off the low-carb wagon, but know that I feel so much better when i stay ON! 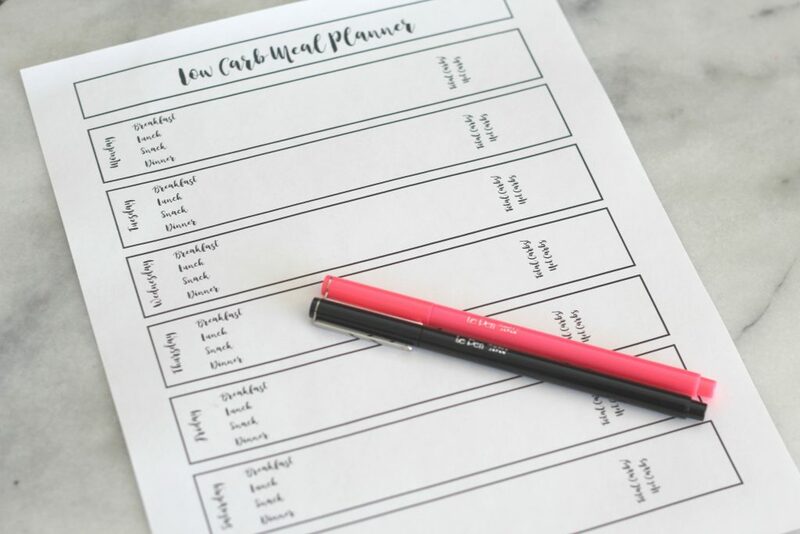 My biggest problem is that i dont plan out my meals, so your planner is going to be a HUGE help! Happy Saturday! Thanks Patty Anne! Let me know if you think of anything that I could tweak to make it even better. I’m always looking for suggestions! I needed this, thanks! Thank you for sharing at the To Grandma’s House We Go DIY, Crafts, Recipes and More link party! Pinned! Nice planner! Thanks for sharing your post at the Inspiration Spotlight party. Sharing. Cheers! See you again soon. There’s a gray and purple box that says ‘sign up here’ and it gets emailed to you!